In an article penned by The Tribune’s local editor Joe Tarica, the newspaper announced it will move on Monday to an office located on Tank Farm Road near Broad Street. Specifically, the daily newspaper is moving to Suite 220 inside the Edna Valley Office Building at 745 Tank Farm Road. 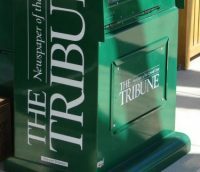 The Tribune will be departing its South Higuera Street location that was custom-designed for a newspaper publishing operation in 1993. Now, the printing presses are long gone from the South Higuera Street location, and The Tribune has a smaller staff that focuses on digital news, Tarica wrote in the article. The Tribune is now primarily printed in Santa Maria. Also, as a result of McClatchy’s recent nationwide reorganization of its newspapers, The Tribune now has a an out-of-town publisher, as well as a regional editor based in Sacramento. On Wednesday, McClatchy’s stock closed at $3.95, the lowest it has been in recent months, if not years. The newspaper publisher is currently faced with a $150 million lawsuit that was filed by United States Congressman Devin Nunes (R-Tulare) over reporting by The Fresno Bee. The Tribune is closing its South Higuera Street office Thursday evening. It will then use the next three days to move to the Tank Farm Road office building. As long as you have people like Tarica running things, and Fountain reporting things, it will keep getting smaller. There isn’t even enough substance to it to wrap my fish in. I get more from the freebies thrown into my driveway. Next they’ll be operating out of a closet in Adam Hill’s home. What a shame to see the TT devolve into a two-page bird cage liner. Congrats to Tarica, Fulks, Cuddy et all for driving a “progressive” stake into its heart…… and then twisting it until it squealed.